It is no secret that there is no love lost between MetroPol and K West Law Firm. After all, the two have opposite agendas. One takes money from innocent citizens by force and passes it up to a faceless corporation. The other takes money from innocent citizens to protect them from the faceless bureaucracy of Metro and its armed thugs. Neither one is especially popular with the citizenry. Still, it came as some surprise when HIH, current proprietor of K West was attacked in his office by not one but two assailants. The cyborg lawyer was beaten so badly that pieces of him were literally falling off. He did, however, capture one of his two assailants and turn him over to police in complete accordance with the law. Police have identified the primary attacker as an unstable gentleman named Bailey. According to sources he has received little more than a slap on the wrist for his attempted murder. His unknown female accomplice, however, managed to elude capture. Speculation runs rampant over the reasons for the attack at this time. Bailey's memory of the events seem unreliable at best, making him a less than ideal witness. There is certainly no proof that this is related to the unidentified parties involved in the murder of the former police chief, allegdly an accompluce to Celes Jade. Similarly, there is no direct link between previous cases of police harrassment and this particular attack. By Nomos law, however, both are to be considered guilty until proven innocent. 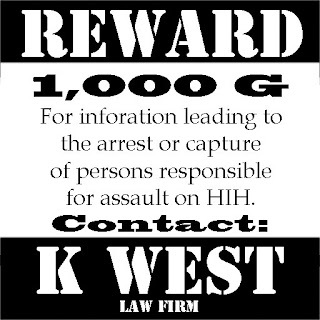 A reward of up to 1,000G for information leading to the identification and capture of the second person in the attack on K West Law Firm has been offered by HIH. Citizens with information are encouraged to stop by the law offices during business ours to share their information. One of this days the Mercs will get really piss for not having their job recognised. In self defense, not chasing him through the street. Maybe the Mercs should consider an ad campaign.